Meet at east beach parking lot. (A Provincial Park Pass is required). After the bike, skate, walk we can swim in the lake, and then have breakfast in Oakbank. We'll skate/bike Pembina Hwy, Turnbull Drive & Red River Drive and back. Attached is our new membership package. Even though our club lost money this past year, the fees have not changed for regular members. We are counting on new members to balance the budget for the upcoming year. We have not had any student members for a few years, and will not attract any with our rates as their Frank Kennedy membership is now included in their student fees. We have dropped student membership fees to try to attract some student swimmers - especially for Tuesday & Thursday practices which have fewer swimmers. Please give your membership form with a signed release and your cheque to Colleen before Saturday, October 3rd, 2015. September 3rd, 2015 @ 7 PM at Greg Giesbrecht's home, 76 Homewood Drive. 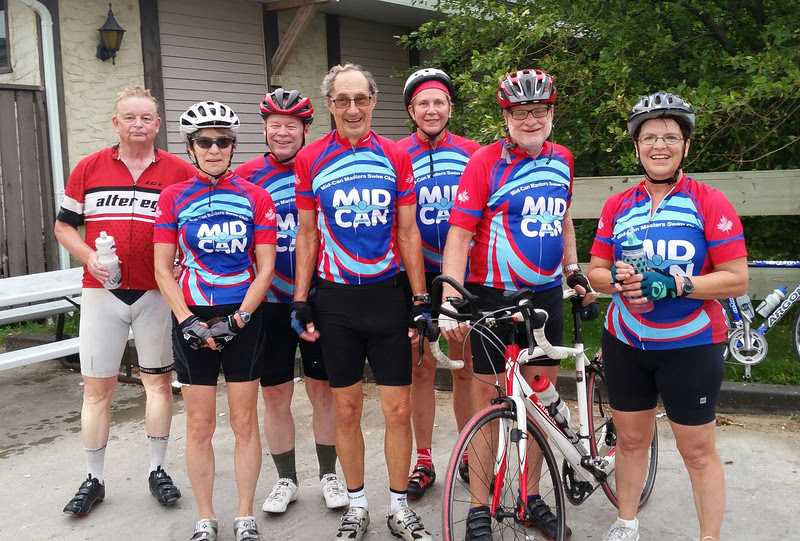 Mid-Can Masters has had a drop in membership this past year which has resulted in our expenses exceeding our revenue by several hundreds of dollars. The executive considered reducing the number of lanes we rent from the University to reduce expenses, but instead has decided on a co-ordinated, multi-faceted membership drive. If we get another 3 full time swimmers - or their equivalent - we will be back in the black. Please come out and bring some fresh ideas as to how we can attract and keep more swimmers. This fall Mid Can Masters will again host the Pop Sidwell Swim Meet. This year will be the 40th year of the meet. The date is Saturday, November 21st 2 PM - 6 PM. We need swimmers and we need volunteers. Should you have any questions about swimming at the meet or volunteering for the meet, Bob Modrcin or Bob Groff will be able to provide more information. Officiating will increase one's understanding of swimming techniques, and the sport in general. Most importantly it is fun! We hope you will join us in continuing the tradition of the Pop Sidwell Swim Meet. The breakfast will be potluck and members are asked to bring their favorite breakfast food to share with others attending the meeting. A sign up sheet for breakfast items has been posted on the bulletin board in the pool. Coffee will be provided by the club. As part of our membership drive, the executive is planning an Introduction To Masters Swimming Program. The program will be advertised on Facebook, and will consist of 10 - 1 hour swims in lane one (by the bleachers) on Thursday evenings from October 1st through December 3rd, 2015. Pal will supervise the swimmers. Other swim clubs have attracted new members with this type of program. 17th FINA World Masters Championships will be in Budapest, Hungary ! On March 11 FINA announced that Budapest, Hungary, will host the 17th FINA World Championships and FINA World Masters Championships in July 2017, replacing the city of Guadalajara (MEX). The FINA World Aquatics Championships will be held from July 15‚Äì30, 2017. The Masters Championship will follow, but the exact dates have not yet been published. The event will be in the Budapest Swimming Complex, a brand new state-of-the-art facility to be built on the banks of the Danube across from Margaret Island in Budapest.